A 37-year-old man was assaulted by two men outside the Grosvenor Casino in Glasgow. A man was left with injuries to his torso and back after being stabbed by two men after leaving a Glasgow casino. 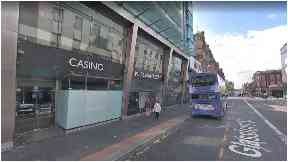 The 37-year-old victim was attacked outside the Grosvenor Casino in Glassford Street at around 5.45am on Saturday. He is believed to have been in the company of the men in the casino before the incident. The suspects fled the scene, heading south towards the Trongate and turning left. The victim then made his way home and called an ambulance. He was taken to the Glasgow Royal Infirmary for treatment to several stab wounds to his torso and back, medical staff describe his condition as stable. Detective Constable Paul Houston from Stewart Street CID said: "This was a violent attack and extensive enquiries are ongoing to establish the full circumstances and trace the individuals involved. "I would appeal to anyone who was in the casino in the early hours of Saturday morning and may have noticed the two suspects with the victim, or indeed witnessed the assault outside, to please get in touch. " He added: "Any motorists with dashcams who were in the vicinity between 5.40am and 6am are asked to check their footage in case they have captured anything which could be of significance." "I would also appeal to any taxi drivers who think they may have picked up two men matching the above descriptions in the area to come forward."